Arduservers running on a Sparkfun ESP8266 "Thing"
This page created in January 2017. 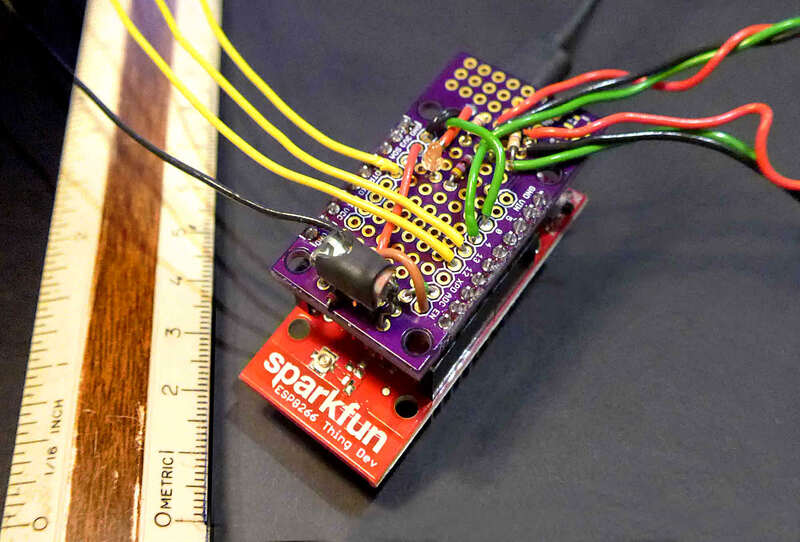 The Sparkfun ESP8266 "Thing" (link to Sparkfun's product page) has been around for a while at that time. It is just one of many ways to enjoy the ESP8266 chip. If you just want the source code then the ALMOSTlatest and greatest version (Mk3) is available as a .zip file with the various "bits" of the Arduino code needed to compile an Arduserver to run in a Sparkfun ESP8266 "Thing". An even better version became available 24 Mar 19... see notes at "bottom" of page (above big circuit diagram) regarding "ar794". But you really ought at least to skim this page. I know, "real engineers" don't RTFM... but, just once, do it the easy way? I've prepared a more general introduction to the ESP 8266 Thing for you, if that's what you want. This page talks about an implementation of my Arduserver idea on a "Thing". 2/19, I released a "Far Watch Watcher" ("FWW")for the Arduserver described in this article. (Or indeed, any webserver returning a line somewhere with data from sensors, in the right format! (Format explained in Watcher's page.) It is free Windows software, to run on any computer that can connect to a suitable server (such as some of the Arduservers described here), and plot graphs of the data being returned by the server. As long as the server presents data in "hhhhsttthhhhstttb" format, the FarWatchWatcher will be suitable. The more robust, more user friendly early version of the FWW software only plots the two sddd values, and it assumes they report a temperature, in DECI-degrees Celsius. (If the application gets 184 from the Arduserver, it will plot it as 18.4 degrees Celsius.) A more advanced version. More advanced also means more hassle to set up.. not a LOT of hassle, but some. The applications are "configured" via ini files. With the code you can download (see below), a Sparkfun ESP8266, a few sensors, notably a DS18B20, you can set up a web-server with inputs and outputs which you can read or set/clear from across the web! Setting up the ESP8266 to respond to enquiries from browsers is not, in itself terribly complicated. Nor, because of the ESP8266, not an expensive exercise. $16 for the ESP8266, and not as much again for the sensors, etc, you will connect to it... most of that will be for the temperature sensors. Get just one, if you don't feel the need of two. A lot of the explanation is in comments in the sourcecode. If you haven't worked much with IP addresses, DDNS, ports, servers: Scan what is below, and say to yourself "That sounds fun"... and then go off to the pages about putting things on the internet. You will thank me, in the long run! Or waste a lot of time learning the ropes the hard way, as I did... gathering "scraps" of knowledge in the wrong order! As with any Arduserver, there is an LED you can turn on and off. (The commands are /led/1 and /led/0) And it shines on a light sensor, and you can "see" what the sensor reading with the /read command. So... watch the value reported by read change after you have changed the state of the LED. (Yes, it is basically a "home made optocoupler"). 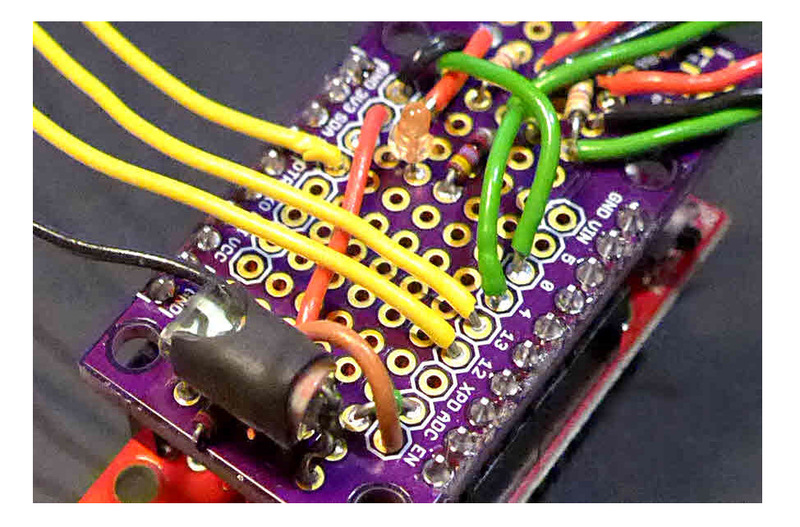 In addition, this Arduserver has two temperature sensors, and two "counters". The "counter" will tell you how many times the state of its input has changed. If the many uses don't occur to you, trust me: There are LOTS of uses! There are LEDs on the system that tell you, if you are in the place the Arduserver is, what the state on the inputs to the counters are. These are separate, electronically, from the inputs themselves. There's also a digital input to the ESP8266 which has been provided for in the software. You can see the state of that input across the internet. Yes, but does it work? Can I play with it? Yes! I have several you might find working on any given day. If when you click on the links below, you get sensible "stuff", instead of "page not found", or "can't connect", the "stuff" has come from an ESP8266 running my Arduserver code. Don't be fooled into thinking that you've "only" accessed an "ordinary" web page! If it is still up... it comes and goes, of course, as any hobbyist device does... you can access my first ESP8266 Arduserver. And there are two more: my second "Thing" Arduserver, and, on the same LAN, my third instance of this design. If none of them are working just now(! ), here's a bit of what you would see. the following. The link in the second paragraph (disabled here) would take you to this page, if you were looking at the page by going to the Arduserver for it. An Arduserver is a little demo of how you can set up a small web-server which will allow someone with a browser to control outputs and read inputs remotely, across the internet with nothing more than a browser. Note particularly in the text above, the line after the "hhhhsttthhhhstttb". Why present the numbers in such an arcane format? Because the format is machine friendly. Once the Arduserver is running at location "A", I can have another computer running at location "B" periodically, without any effort on my part, interrogating the Arduserver. It can draw a graph of the windspeed data, and the temperature. And more importantly it can ring an alarm bell if the temperature falls lower than it should, so I can send someone 'round if the heating fails and I am headed towards frozen pipes. There is more on this concept of a program to watch what the Arduserver is reporting on the page I wrote about that. At 10 Jan 17, the page is dated, but if what you see there is interesting to you, please get in touch? It seemed like a lot of work to produce this web page, let alone the software you can download from it. However, credit where due: I only ran the last half mile of the marathon. The software here is an amalgam of the webserver demo from Sparkfun for their ESP8266 Thing ("Dev Board" version... $16), and of some Dallas 1-Wire temperature sensing code for Arduinos. Full credits, webpage references, in the sourcecode. And those wouldn't have been possible without the prior great work of the ESP8266 community and the Arduino community. And before them, the good people at Dallas Semiconductor, who brought us the excellent 1-Wire. I won't start on those deserving of credit for WiFi and the internet, which are also used in this, of course. My first Arduserver allowed only a very small web-page to be served... and was a pig to program, because if the web-page got too large, the "fail" wasn't "pretty". Things Just Went Weird. The fact that you are reading this suggests you probably have what you need, if are reading it at home. In a school, there may be "issues" about connecting things to the network. Talk to your tech people. And you need an ESP8266. $16. Big deal. Or an Arduino with an interface to your LAN. You'll have to tweak the code, to work with the alternative hardware. The Arduserver is best installed first as something you access from a PC on the same LAN that the Arduserver is on. Using a numeric, local, IP address... something like "192.168.0.23". There's nothing "special" about any of this. Anything you might attach to the LAN would entail similar issues. An IP-cam(era), for instance. You need an ESP8266 connected to a LAN... for "the simple life". The connection is via WiFi. Arduserver will "work" with none, all, or any combination of the following external "bits". const int DIGITAL_PIN=12; // Digital pin to be read. Of course, you have to be careful that you don't reassign it to a pin that is already in use for something else! You can put that output elsewhere if you wish to...but you might as well use pin 5 for SOMETHING that an LED can tell you about. On the ESP8266, only pin A0 is capable of doing analog to digital conversion. (And it should not be subjected to more than 1.0v.) So you are A Bit Stuck if you would like to move the monitored analog signal elsewhere. You can't. But there is room for LOTS of flexibility... and remember... you don't have to use all of the inputs and outputs that the software is willing to "drive". RIGHT CLICK- select "Open in new Window" for a re-sizable, separate copy of the wiring information. Of course, your browser must not be filling your whole screen, if you want to use this aid. The diagram on the left shows you the things to connect. On the webpage produced by the software, most of the things you see are reported explicitly, in text. In the case of the pin sharing a line with the on-board LED, I wouldn't go over 10mA, if I had an external LED on the pin too. Whether you connect the resistor to the 3v3 or GND won't make a lot of difference... but if you do, their behavior will be as follows: When the output LOW, the LED will be ON. This will be consistent with the on-board LED. The messages in some older versions of this Arduserver (those before 23 Mar 19) may be 180 degrees out of phase with the LED states. Note that when set up like this, that while the command "led/1" does turn the LED on, it is potentially confusing, because user might think that "led/1" is saying "make the state of the pin controlling the LED "1", i.e. high." But risking that is worth it- to have your external LEDs behave as the on-board LED (on pin 5) behaves. Signals are sent to the pin defined on the diagram as "LED_PIN" BOTH from the code in the "FromSparkfun" tab of code, and from the Arduserver software. Typically, you would have an LED on the line. The code switches the line high and low (about 0.1 sedcond each) whyile trying to establish the device on the WiFi network, or while trying to re-establish it. The "Arduserver" software ALSO uses this output to drive an LED (or other), as directed by /led/0 and /led/1 commands. Whatever purpose you have in mind for the result of the /led/0 and led/1 commands, it MUST BE TOLERANT of this other operation of the output, unless you take that out of the FromSparkfun code. First "sttt", e.g. +234 is temperature sensed by Dallas temperature sensing chip (it can be a DS18B20, DS18S20, or DS1822), interpreted thus: +234 indicates + 23.4 degrees Celsius. Sensed by the chip on "ds0". Second hhhh: The count of pulses input via Pin_Pulse1Input. Note two things: That's "PulseONE", not PulseELL (Anemom was "Pulse0"). And using pins 2 and 14 is okay... as long as you don't ALSO (at the same time) want to use an I2C peripheral. 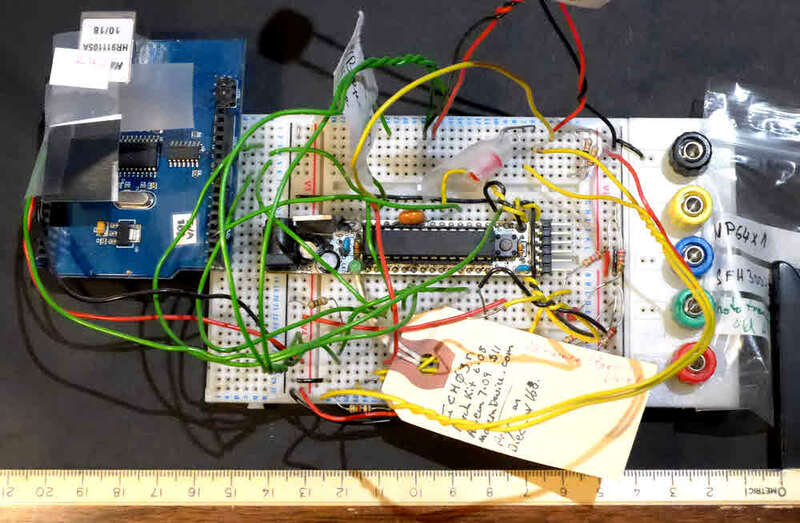 This essay originally written alongside the building of my first Sparkfun ESP8266 "Thing" Arduserver, January 17. At 12 Jan 2017, the latest and greatest version (Mk3) is available as a .zip file with the various "bits" of the Arduino code needed to for compile this Arduserver. Be sure to see the note below in "Details, details" about turning the LED on and off. There are multiple .ino files because I used tabs to make working on the code easier. Just unzip the .zip. It will create a folder with four .ino and a small text file in it. Point your Arduino IDE at ESP8266_web_server_for_fw002_Mk3.ino, and all should be well. Once that's in place, compile away. Change "server" to change which port the web-server operates on. I have never needed to change the last two. As with Mk3, there are multiple .ino files because I used tabs to make working on the code easier. Just unzip the .zip. It will create a folder with four .ino and a small text file in it. Point your Arduino IDE at ESP8266_web_server_for_fw002_Mk2.ino, and all should be well. A plea! If I forgot to remove my WiFi SSID and password from the sourcecode before doing the latest zip, please contact me asap?? Look in the main .ino for "const char WiFiSSID". Thanks! In the case of the LED that you can turn "on" and "off" by commands from your browser, it may be that telling it to go "on" may actually result in it going "off", and vice versa. It is a tangled tale of how exactly the LED to be operated is connected to the ESP8266. Rest assured, if the operation is inverted, you will at least get consistent results... until you revise the hardware! And it isn't hard to tweak the code, once you have decided once and for all how you want the hardware, so that the messages on the screen, and the commands, and the actual state of the LED are all in step. The ESP8266 provides you with an LED onboard. Already hooked up to one of the GPIO pins of the processor. Almost like the LED on D13 of a traditional Arduino. However, instead of being on D13, it is on D5. The comment may be WRONG... "HIGH" may lead to on, "LOW" to "off", depending on how the LED is wired to the pin. In another tedious tale of inversion, you may get a HIGH value from the light sensor when it is in the DARK, and a LOW value from it when it is IN THE LIGHT. This too is easily "fixed" if it annoys you. Even better! New 24 Mar 19: "ar794"
But! If you simply set "boDriveStepperNotLED" to "false" at the top of the code... where currently it is set to "true"... then the code will behave as described on this page. Even with boDriveStepperNotLED set true, the software still counts edges on Pin_Pulse1Input (switch openings/ closings. Don't "feed" it with a voltage, unless derived from the 8266's 3v3 rail), and reports them in the second "hhhh" datum of the machine-friendly output. I hope you enjoyed this? Please tell people about the page, if you did. Please get in touch if you discover flaws in this page. Please mention the page's URL. (esp8266/Esp8266-Arduserver.htm). Ways you are using your ESP8266 Thing would be of interest, too.